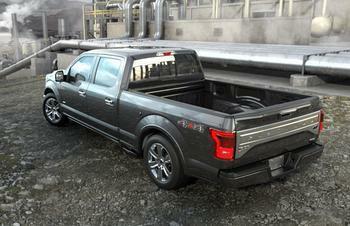 Ford is recalling 1.48 million model year 2011-13 F-150s with 6-speed automatic transmissions. The transmission that may experience an intermittent loss of the transmission output speed sensor signal to the powertrain control module, potentially resulting in a temporary, unintended downshift into first gear. Depending on vehicle speed, a downshift to first gear without warning could result in a loss of vehicle control, increasing the risk of a crash. Dealers will update the powertrain control module software in the affected vehicles. Owners may contact Ford customer service at 1-866-436-7332. The Ford reference number for this recall is 19S07.